Jack: Jack Butala Jill DeWit. Jack: Welcome to our show today. This episode, Jill and I talk about land leases and how they feed families for generations. Before we get into it, let’s take a question posted by one of our members. On landinvestors.com online community. It’s free. Jill: Okay. Jered asked, “I could use help from my fellow Land Academy peers. My CPA just sent over her LLC’s tax return for the first year in the land business. She claims we need to pay taxes on the full profit of our term’s deals up front. So if we purchase the land for $2,000 and sold it for $8,000 with payments over five years, she claims the IRS is clear that we need to pay the taxes on the $6,000, the 6k profit up front. Jack: Jered, this is an excellent question and all week I’ve been saying, we choose the hard questions for a reason. I want you to promise me and I want you to send me a note at jack@landinvestors.com. Promise me that you’re gonna go get a new CPA today. Jill: And that’s the answer to the question? Jack: I can answer the question. I can get into this in great detail. I’ve gotten this question over the years. I had a former partner, Park McClusky, quite honestly who had the same problem with his tax person and he solved it by getting another one. It has to do with their- you have two choices on how you file. How you keep books. On an accrual basis and a cash basis and I’m not gonna get into it because I don’t want to expose myself from a liability standpoint, but your CPA is wrong. How could you pay money that you haven’t made yet? Jill: Mm-hmm (affirmative). That’s what I think too ’cause what if the guy defaults on January 2? Jill: That’s not. You can’t. Jack: So sometimes professional consultants like that are very, very, very academic and brainy. And they are extremely risk adverse and they have their nose in a book to the point where they don’t even know what reality is. Jack: A lot of professors are like that. And this person is wrong. 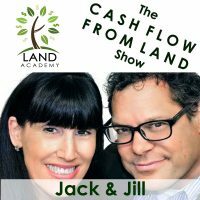 Jack: If you have a question or you want to be on the show, reach out to either one of us on landinvestors.com. Today’s topic, land leases feed families for generations. I love this. Jill’s got a beautiful story for us. This is the meat of the show. Jill: So we met this girl, we were at an event, where were we? I can’t remember where, were we in Long Beach? I can’t remember where we went. Jack: I love these, I love going to these events by the way. Jill: I know, but I drug you anyway. So that was funny. So anyway. So we arrive at this event and well it looks- well here’s, this is the way Jack rolls too. So we get to the event, he’s gotta eyeball it first and see if we’re going in. Jack: Food and beverage situation was outstanding at this event, by the way. Jill: Yes. So that’s part of why we went in. He’s like, “Yeah, this could be okay. There’s people in suits. There’s all kinds of these people are legit. I’m liking it. Let’s go in.” So we go into the event and walking around and we meet this girl. Actually she came up to us. We were talking to somebody else and we were kind of sharing a table and she just started chatting with us. She just had such an interesting story. What is was is she’s doing parking lots. I’m like, “What the heck are you talking about?” She goes, “Well, here’s the deal. My family has a construction business and we can do all kinds of things. But I found this niche” because of where she works. What was too, what was beautiful about the story, one of those things, she fell into it by accident. Because of where she works, she started learning about zoning and planning things like that and I can’t remember exactly what her day job is. Jack: She’s a contract- she’s a cost accountant for a commercial contractor. Jill: That’s it. And her company, her family happens to do construction stuff on the side so they can lay cement and do pavement and all that good stuff. That’s what the other thing that went- there’s more to this. So anyway, she’s finding the properties very cheaply so she liked talking to us about a better way to find these properties even cheaper and how to mass mail people and come up with more properties. ‘Cause then she knows how to A, get them zoned what she needs them to be zoned in. And B, her family goes out and literally does the work. They literally grade the land and lay the pavement and so that for parking lots where she can lease it out. Jill: And that was her story. Jack: So here was my suggestion to her ’cause she’s already got the industry figured out. Did you ever drive down the street, you see a big sign in the- it looks out of place. Pounded in the front yard of a little house that says, “Zoned commercial.” Or “Dual zoned.” Or “Endless possibilities.” Exclamation point. Or make up a slogan that some silly real estate agent made up. What they’re saying is that the property that’s for sale is not being used the way that it should and it needs to be knocked down and put a strip center or an office building or in this case, a parking lot. Could be put there in its place. So my suggestion to her was sort for zoning. Not even property types. Forget it. If it’s zoned compliant to a parking lot, then you can figure out on a square foot basis, price per square foot on the lot. ‘Cause you have all the information at Realquest. You can make your life really easy. You’re gonna hit, eventually if you send out enough mail in like L.A. County or a large county like this, a bunch of people are gonna sign your offers and send them back because they think that they just have a little house there. And really what they have is a commercial property’s that’s waiting to be a parking lot. Jack: So it was a- she was excited. Jill: Mm-hmm (affirmative). It was cute. She was- then she kind of followed us around after that and it was really sweet too. It was good. Jack: So no matter where you are in real estate or whoever you are, I don’t care if you’ve done a million deals, sending out offers, if you’ve never tried it, it will streamline your operation and really dramatically increase and probably replace whatever deal flow you have going on right now. If you’re taking calls from brokers and agents and you’re looking in the [yama 00:08:05] ads to try to find a property, we have news. Jack: It is the absolute wrong way to do it. Jill: And time consuming and hard. You’re chasing deals and you’re just trying to- you really can’t say you got there first ’cause there’s a broker involved. So now there’s already money that’s being spent that you could’ve, you could have. Jack: This girl was- I asked her how old she was, she’s 24. Can you imagine where she’s gonna be in 10 years? Jack: If she continues to do this? Jill: How amazing that she figured this out. It was really good. Jack: I was proud of her. I felt like parental pride. Jill: Yeah. She was a cute, she was cute too. She was like five foot nothing, pretty long dark hair, and just a real sweet girl. Jack: She knows what she wants in life and she was going after it and I respect that. Jill: We use it every day to buy property for half of what it’s worth then sell it immediately. Jack: You are not alone in your real estate ambition. Jill: Yeah. So then the end of the story is, so we were only there for about, I don’t know, maybe 45 minutes. It was like, “Can we go now? Can we go now? Can we go now?” And we did. Jack: Yeah. It’s way easier to do this show and talk about this stuff than it is in person. Do you think that? Or do you think the opposite? Jill: Oh yes. Even though you know it’s interesting- that you’re right. ‘Cause even though we were technically in a room surrounded by our peers, quote unquote, ’cause they are also investors, I still found myself doing a lot of explaining. And I don’t understand that. Jack: I really don’t understand that either and I agree. Jack: Maybe it’s just better to talk like this and then not get anyone’s reaction. Jack: Maybe people are beating their heads on their own dashboards right now, this show is so bad. Jill: You know what I find though too? Doing a show and the other things that we do, I can reach and help more people than six people in a meeting. You know what I mean? Jill: So that’s how I felt too. I’m like, I’m not, I can’t really- if I personally walk around one by one on one and try to help everybody, it’s not gonna work. Jack: And that’s what happened that night.